EuViz Angels help our scholars by donating into the scholarship program. 20 scholars (YES twenty!) will come to Berlin from all around the world: Israel, Brazil, South Africa, Romania, Hungary, Greece, Turkey, Poland, Morocco, Belgium, France, US, Switzerland and Germany. Our great sponsors already covered a certain amount of money but we continue to look for a few more donations. And that is where EuViz Angels come into play. Everybody who donates more than 20 Euro will have the EuViz Angel badge, showing up in our participants map. Click on the map and see who has already donated. Donate now! Any amount helps! Curious, who already agreed, to be an EuViz Angel? See the List of Angels here. Our scholars count on you!!! BTW: If you want to support our scholars and promote your business you might wanna think about placing an ad in our conference program. All the money from these ads goes into the scholarship program too. 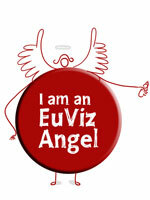 So you’d receive the EuViz Angel Button too, if you decide to place an ad!